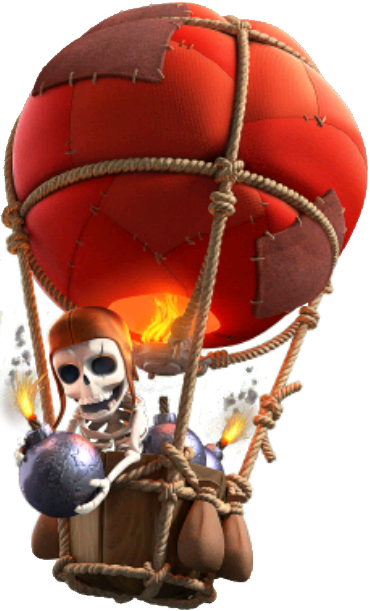 The Balloon is one of many Regular Troops in the Clash of Clans game. Balloons are the sixth overall troop unlocked in the Barracks. Balloons are “promoted” Wall Breakers that now attack from a hot air balloon. They drop bombs on the villages with a large area splash damage, but can be easily taken out by any anti-air defenses (such as the Air Defense). Balloons are slow-moving aerial units that do devastating amounts of splash damage to ground targets. They are the slowest-moving Troop in game. Balloons drop to the ground then explode, dealing additional damage when destroyed. Balloons prioritize Defensive Structures above all other targets, and will bypass all other types of enemy Buildings and Troops while any Defenses remain on the battlefield. This is true even if they are under attack by enemy Clan Castle troops, Heroes or Skeleton Trap skeletons. Note that like all Troops that prioritize Defenses, Balloons do not consider the Clan Castle to be a Defense regardless of whether or not it contains enemy troops. Once all Defenses are destroyed, Balloons become like any other Troop with no preferred target; they will attack the nearest building to them regardless of type, and will turn and attack enemy Units if they become aware of any nearby. Description of common tactics of usage a Balloon on a battlefield is Here. Appropriately, at each level the Balloon pilot resembles a similar-level Wall Breaker. At level 3, the Balloon receives wooden armour attached to the sides of the envelope underneath its rigging. At level 5, the Balloon’s basket gain golden spikes attached to its side and the bombs it drops become golden in color. At level 6, the Balloon’s red envelope turns to black with a white skull on it, and the wooden armor become gray-black steel. Balloons are the first aerial troop unlocked in the game. Balloons are piloted by Wall Breaker units. Balloons are the slowest-moving and slowest-attacking Troops in the game. You can complete many of the Single Player Missions using a single Balloon only, as many do not have aerial defenses. You can have a maximum of 48 Balloons at one time in a complete set of fully upgraded Army Camps. This number increases to 55 if you include the 7 that can fit into a fully upgraded Clan Castle. Due to a peculiarity of the Balloon attack, the first bomb a Balloon drops on an individual building does damage the instant it is dropped; the last bomb it drops will do no damage. Balloons “hover around” slightly while they are attacking. A level 6 Balloon has the same design on its exterior as a Seeking Air Mine, which suits as a Seeking Air Mine does significant damage to level 6 Balloons. The 17 Apr 2013 update granted the Balloon the ability to explode and deliver splash damage when it is shot down. Although piloted by former Wall Breakers, Balloons do not use kamikaze-style attacks (though they do still explode on death). The Balloon’s damage upon death is the same as its DPS. While most levels of Balloons drop bombs that are carried by Wall Breakers of the same level, the level 6 Balloon does not drop barrels, but gold bombs instead. Each upgrade above level 2 increases the Balloon’s damage by 50%. Currently, the Balloon is the only air troop that has no wings. If a Balloon’s death causes the battle to end (if there are no more non-Healer troops, Heroes, Lightning Spells or Earthquake Spells remaining), the Balloon will appear to drop to the ground (as it should) but it will not deal any damage upon death. The Balloon is the only Troop with a death animation. When anti-air defenses defeat a Balloon, it will fall to the ground, damaging any Buildings within its death damage radius. The Balloon – Breezy Weekend! !